The applied leopard's head represents the London hallmark. Edward Barnard & Sons was one of the leading London silver manufacturers throughout the 19th century and the first half of the 20th. The firm was founded in 1829 by Edward Barnard. It quickly established itself as one of the major suppliers to the London retail silver trade. 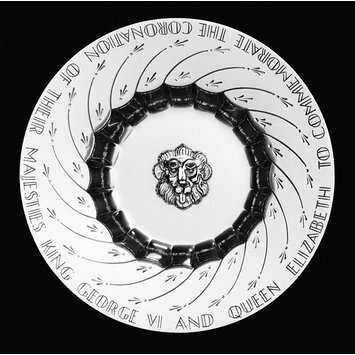 Circular, an applied, cast, leopard's head representing the London hallmark in the centre. The rim embellished with engraved curved lines and stylized leaves. In the centre is an applied leopard's head representing the London hallmark. The applied leopard's head represents the London hallmark. Edward Barnard & Sons was one of the leading London silver manufacturers throughout the 19th century and the first half of the 20th. Founded in 1829 by Edward Barnard, the firm quickly established itself as one of the major suppliers to the London retail silver trade. Originally in the collections of the Worshipful Company of Goldsmiths and sold to the V&A as a duplicate in 1977.